Ask about the 20% DISCOUNT on our 2019 Spring Bear hunt. HUNTING AGE for DEER, Spring & Fall BEAR & BIRDS 16 yrs of age & 18 for MOOSE! Legal age (includes age 12 for small game when accompanied by an adult). ... and remember, a second bear license is available each year. Welcome to our 4 Star Lodge (licensed and graded by the Prov. of NB) where you will experience the thrill of hunting for Moose, Deer, Spring and fall Black Bear, Grouse, Woodcock and Coyote. Our Deer, Bear, Bird Hunting or Coyote Packages include your guide, delicious home-cooked meals, 6 nights accommodation in our comfortable lodge, gate fees and transportation to & from the hunting area. Licenses and Taxes are extra. Licenses are available on site. We hunt on 2,000 square miles (5,000+ sq. Km) of controlled-access land. Grouse, Woodcock and Duck hunting is excellent. Our success rate runs from 80-90% for Black Bear! We offer exclusive bear baiting rights on the largest private hunting area in the province.In our bear baiting area many Bear are taken in the traditional "Boone" and "Crockett" class each year. Our bear licenses are allocated and we will guarantee you a bear license. 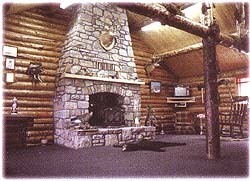 To see where North View Hunting & Fishing Lodge is located, rates, season dates and directions to our lodge from the US, Visit our "Map and Dates & Rates" Page. For photos, visit our Photo Gallery page.